This article is about the electromagnetic propagation phenomenon. For other uses, see Multipath. In wireless telecommunications, multipath is the propagation phenomenon that results in radio signals reaching the receiving antenna by two or more paths. Causes of multipath include atmospheric ducting, ionospheric reflection and refraction, and reflection from water bodies and terrestrial objects such as mountains and buildings. Multipath causes multipath interference including constructive and destructive interference, and phase shifting of the signal. Destructive interference causes fading. 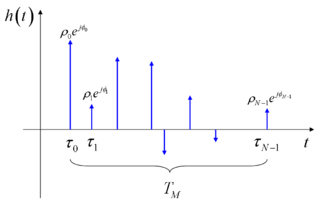 Where the magnitudes of the signals arriving by the various paths have a distribution known as the Rayleigh distribution, this is known as Rayleigh fading. Where one component (often, but not necessarily, a line of sight component) dominates, a Rician distribution provides a more accurate model, and this is known as Rician fading. In facsimile and (analog) television transmission, multipath causes jitter and ghosting, seen as a faded duplicate image to the right of the main image. Ghosts occur when transmissions bounce off a mountain or other large object, while also arriving at the antenna by a shorter, direct route, with the receiver picking up two signals separated by a delay. 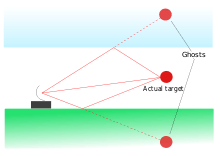 In radar processing, multipath causes ghost targets to appear, deceiving the radar receiver. These ghosts are particularly bothersome since they move and behave like the normal targets (which they echo), and so the receiver has difficulty in isolating the correct target echo. These problems can be overcome by incorporating a ground map of the radar's surroundings and eliminating all echoes which appear to originate below ground or above a certain height. In digital radio communications (such as GSM) multipath can cause errors and affect the quality of communications. The errors are due to intersymbol interference (ISI). Equalisers are often used to correct the ISI. Alternatively, techniques such as orthogonal frequency division modulation and rake receivers may be used. In a Global Positioning System receiver, Multipath Effect can cause a stationary receiver's output to indicate as if it were randomly jumping about or creeping. When the unit is moving the jumping or creeping may be hidden, but it still degrades the displayed accuracy of location and speed. Multipath propagation may also happen in wired media, especially where impedance mismatch causes signal reflection. A well-known example is power line communication. High-speed power line communication systems usually employ multi-carrier modulations (such as OFDM or Wavelet OFDM) to avoid the intersymbol interference that multipath propagation would cause. The ITU-T G.hn standard provides a way to create a high-speed (up to 1 Gigabit/s) local area network using existing home wiring (power lines, phone lines and coaxial cables). G.hn uses OFDM with a cyclic prefix to avoid ISI. Because multipath propagation behaves differently in each kind of wire, G.hn uses different OFDM parameters (OFDM symbol duration, Guard Interval duration) for each media. Mathematical model of the multipath impulse response. The mathematical model of the multipath can be presented using the method of the impulse response used for studying linear systems. Suppose you want to transmit a single, ideal Dirac pulse of electromagnetic power at time 0, i.e. 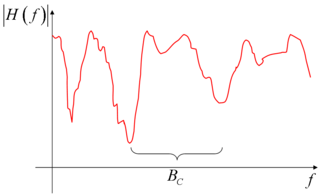 where is the number of received impulses (equivalent to the number of electromagnetic paths, and possibly very large), is the time delay of the generic impulse, and represent the complex amplitude (i.e., magnitude and phase) of the generic received pulse. As a consequence, also represents the impulse response function of the equivalent multipath model. Mathematical model of the multipath channel transfer function. In practical conditions and measurement, the multipath time is computed by considering as last impulse the first one which allows to receive a determined amount of the total transmitted power (scaled by the atmospheric and propagation losses), e.g. 99%. where the last right-hand term of the previous equation is easily obtained by remembering that the Fourier transform of a Dirac pulse is a complex exponential function, an eigenfunction of every linear system. For example, with a multipath time of 3 μs (corresponding to a 1 km of added on-air travel for the last received impulse), there is a coherence bandwidth of about 330 kHz.